Old town apartment near the beach, 2 beds, big terrace and view over the sea . 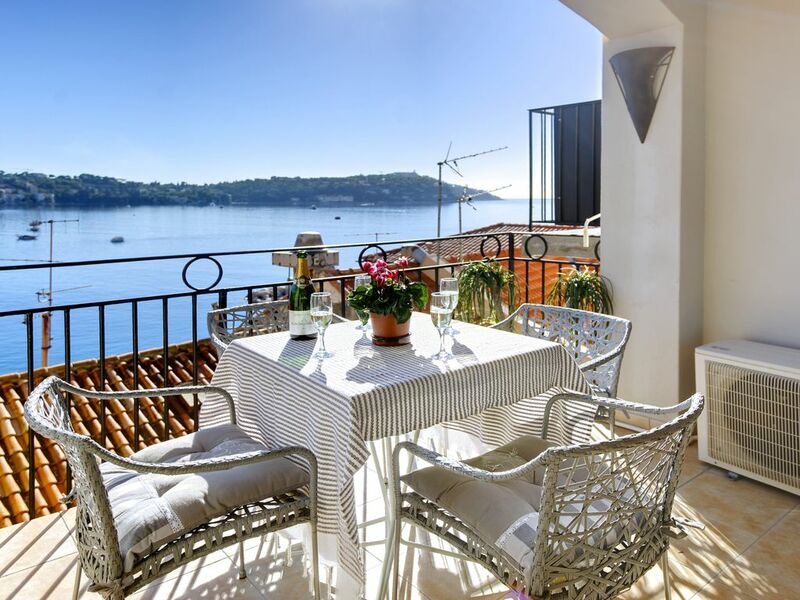 'Artistes Tresor' is a beautiful apartment in the heart of the old town with a large terrace and breathtaking sea view over the whole bay of Villefranche Sur Mer. Being in the best location in town makes it the perfect setting for a wonderful holiday. Enter the doorway of the house built in the 16th century and be uplifted by the view that is truly unforgettable. The local agent described the apartment, renovated by the artist owner, as 'giving the feeling of being in another poetic world'. Our guests return time and time again. Discover all that VIllefranche has to offer moments away. Great restaurants, the beach and sea a few minutes walk away and the village full of history and charm. The local shops are on the doorstep. With its micro-climate it is perfect here all year round. Without doubt this is one of the worlds most romantic and beautiful locations, within easy access of Nice airport. This is an old village apartment designed for comfort for all the family. Join us soon! All Year Round: The location is perfect for a holiday any time of the year as the area has so much to offer and Villefranche benefits from a micro climate. Rue Obscure, which is one of the oldest streets in France runs under the apartment and is unchanged since the 14th century. Villefranche is the most charming and authentic town on the Cote d’Azur, nestled on the spectacular shores of the Bay of Villefranche, yet just minutes from Nice and Monaco. Still a genuine French fishing village with a wonderful local culture — yet also attracting a very interesting international group of visitors and residents, including students that attend the renowned French language institute called the Institut Français. This is a wonderful area for walkers with the coastal paths and the hills close by. For example there is a superb walk around Cap Ferrat (about eight miles). The American sixth fleet were stationed here during the second world war. Villas and Gardens to visit: The unique micro climate has facilitated the development of world renowned gardens which are open to the public such as Villa & Jardin Ephrussi de Rothschild on Cap Ferrat, and Villa & Jardin Kerylos in Beaulieu sur Mer, both within walking distance. There are additional renowned gardens in the area of Menton. Jean Cocteau Chapel and the Citadel: Jean Cocteau painted the interior of this most beautiful chapel on the waterfront. It has been recently restored to its former glory. Ville franche is a village full of art and artists. Visit the ramparts of the Citadel and take the guided tour into the Sculpture Gallery and through the cobbled street of the old towns history. Visit the tourist office for details. I found myself in Villefranche in 2002 for the first time. I was enchanted from the outset and saw my apartment on the same day I arrived. I decided to sell my house in London to buy it and knew that I would have to share it from time to time in order to pay for this expensive impulse......It is the best thing I have ever done. I hope you love it as much as I do! I realised that the location and view of the sea was priceless. The uniqueness of the location and the age of the building is something that can't be replaced - it has evolved over hundreds of years. It truly is the best location in the South of France. It still retains it's charm due to the fact there are no big hotels around and about. Both bathrooms have a bath and shower in the bath. We supply soap and toilet paper to get you started. Fully fitted american style kitchen. There are two fridges, one in the kitchen and an extra one in the store cupboard for convenience. A large terrace with table and chairs overlooking the sea. There are wonderful food shops on the doorstop and there is a small supermarket three doors away. Everything you could possibly need is outside your front door. A car is not necessary as the public transport is excellent. We provide beach towels. I leave various condiments in the store cupboard as there is nothing worse than finding the cupboard empty when you arrive and having to buy just about everything. My kitchen compact and fully equipped with granite work surfaces. To celebrate my big birthday this year I rented this beautiful flat with 4 other friends. I'm familiar with Villefranche and this is in the best location, just a short block up from the sea and in the center of town. The beds and bedding exceeded my expectations, the bathrooms were high quality, and the kitchen was well-furnished. And oh the balcony, that was fantastic. We'd be out there for coffee and in the evenings with wine. The flat is up 3 flights of stairs or so but given the amount of amazing food, was grateful for the tiny bit of exercise. The property manager was quickly responsive to the little questions I had. We were there during a hot spell and it was a tad warm with only one a/c in the living room, but there were fans and I understand the owner will be adding a/c units. I would absolutely stay here again, it was one of my best rentals anywhere. Thank you!! I am so delighted that guests love Artistes Tresor as much as I do! Looking forward to welcoming you in 2019! Wow time flies and it will be 17 years in January since I opened my door to guests and have worked with HomeAway. It has been a total joy! Looking forward to many more years! The apartment was in a perfect location in Villefranche-sur-Mer with lots of very good restaurants on the doorstep. Right in the heart of the old town with a fantastic sea view. We really enjoyed sitting on the balcony watching the boats coming in and out of the harbour. The apartment was well equipped and comfortable for our family group of six and we would all recommend to friends and family. Hope to return to Villefranche in the future and would definitely hope to stay st Artist Tresor! The apartment was clean and well equipped and provided a perfect base for exploring the coast. We went to Monaco, Menton and into Itsly as well as going back to Nice. A couple of days lounging on the beach were, we felt, then deserved. Decent restaurants in Villefranche were a welcome feature. We were in Villefranche for 2 weeks and really enjoyed this apartment. The place is in the heart of the old town and has a beautiful view of the Bay of Villefranche. The apartment is very clean and the property manager (Donna) was very welcoming and accommodating. Delighted that new guests continue to enjoy my apartment. We also look forward to welcoming them again and Donna appreciated this very nice family. Hope to see more of you soon! Following a delay in Paris due to a train strike, our arrival in Villefranche-Sur-Mer and the apartment was with great relief. We were delighted to see the apartment was just as we had seen in the pictures for so long. The apartment is clean and very well maintained. Everything is so close therefore you can either relax inside or on the terrace or travel out. Would recommend a trip to the Friday markets in Italy, however just walking around the local area is just magical. Would definitely recommend, a pity it is so far from Australia, as we would certainly be back. Many thanks to both Mattie and Donna for all you help and assistance. Following a delay in Paris, to arrive at Villefranche-Sur-Mer was a relief. To our delight the apartment was just like the pictures we had viewed for so long. The apartment is clean and well maintained. The real plus it is so close to everything which means you can just relax or travel easily to other places. The information provided in the apartment and by Donna was very helpful. Would recommend going across the boarder to Italy for the Friday market. A great six days (we lost one because of train strike), for a family of five. Definitely recommend, a pity it is so far away from Australia. Villefranche is situated 4km from Nice Centre and 7km from Nice International airport. A well kept secret as it retains it's charm due to lack of major hotels nearby. You can happily spend all your time in the Village discovering it's wonderful history and why artists such as Jean Cocteau and Sommerset Maughan loved this area so much. In the 60's the music of the Rolling Stones could be heard across the bay from their villa on Cap Ferrat. Yet the village still retains it's authentic feeling. If you do wish to venture forth, the train which is 7 mins away runs all along the coast. Nice or Monaco are ten mins away or you can be in Italy (Ventimiglia) in 40 mins. The village of Eze is 20 mins by car or St Paul de Vence, Cannes and Antibes about 40 mins. A car is not essential and the walks here are fabulous. There is parking nearby. This is the best location on this fabulous coast by far. The French language Institute, Institut Francais, is a 10 minute walk away. Other Activities: the area is full of art and history. Ski: One and a half hours and you can be in the mountain snows if you love skiing in the winter. PLEASE NOTE We take 25% deposit via HomeAway to secure your booking . I have been advertising with HomeAway since 2002 and over the years there have been more and more additional charges to guest and owners which effect the price we charge our guests. Please note that there will be credit card charges added to your final payment. Your deposit will secure your booking but when it comes to the final payment we can now take this in dollars to a US bank, sterling to our UK bank or Euros to a euros account. This is simple and just actioned by bank transfer and I will give you these details once the deposit is paid. The balance is paid by bank transfer and we accept dollar, euros or sterling into our dollar, euros or sterling account for ease. You can contact me via www.villefranchevacation.com for more information. Please be aware that if you pay the final balance via the HA portal all bank charges will need to be paid on arrival. There is a housekeeping fee of €220 charged for weekly rentals and €350 on a monthly rental. Rental fee includes utilities and linens (cotton sheets, allergy free pillows-), towels, beach towels, kitchen towels. A security / damage deposit of 500 euros will be collected upon arrival in any currency convenient to you and returned prior to departure. Service charges are collected upon arrival in cash. We also leave basic supplies (toilet paper, salt and pepper etc) so you don't have to immediately run out and shop when you arrive. There is secure wireless DSL that enables you to connect within minutes of your arrival, should you need to. Manager's Cancellation Policy Please ask the manager or check their rental agreement when booking the property.